This post was created in partnership with Health-Ade and The Feedfeed. All opinions are our own. Tomorrow is the first day of summer, and we are diving right in. In less than 48 hours, we’ll be sailing on crystal clear waters 3500 miles from Los Angeles, sipping on dark and stormys, passion coladas, and soaking up Caribbean sunshine in the tropical British Virgin Islands. Ryan’s parents are experienced sailors, and every few years, they invite the family to explore the seas in a 45-foot catamaran that will be our floating home for the week. Stocked with a full kitchen complete with an oven and stove, the eight of us will be cruising in the water—with laughing gulls tagging along, waiting for our nieces Stella and Lucia, who will throw them a treat. With four bedrooms, four bathrooms, and a sound system which will have Bob Marley and Harry Belafonte on repeat, our crew will be adventuring around the neighboring islands that make up this picture-perfect region—sampling fresh local fruit, snorkeling in 80-degree waters teeming with coral reefs and rainbow-colored fish, and enjoying some much-needed relaxation after this past year and a half of writing the cookbook! But before we embark, we’d like to leave you with a brand new recipe and a refreshing drink to go with it. Spice up your summer with this piquant pairing. 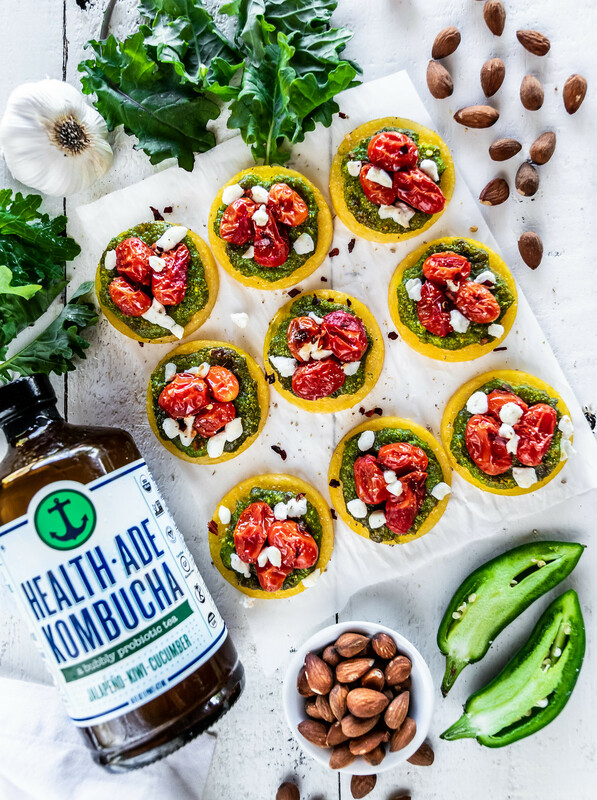 We partnered with The Feedfeed and Health-Ade to create a recipe accompanying their new Jalapeño-Kiwi-Cucumber Kombucha, an organic cold-pressed beverage made with fresh, simple ingredients and filled with healthy probiotics. Naturally carbonated, cool and sweet with a hint of jalapeño heat, this tangy fermented tea is a delightful complement to our bite-sized mini-pizzas. If you haven’t tried polenta before, this is a delicious introduction to these tender golden rounds made purely from cornmeal. Topped with a homemade pesto of toasted almonds, fresh kale, pecorino cheese, garlic, lemon juice, and a jalapeño pepper, and garnished with sautéed burst cherry tomatoes and crumbled goat cheese, pizza night is just a few ingredients away—plus this is the perfect appetizer for anyone who is gluten-free. These cute hors d’oeuvres are quick and easy to prepare, and can be turned into a meal when served with a tasty side and a sweet dessert. Okay, our bags are packed and it’s beginning to feel a lot like summer—see you on the Islands! Place the almonds in a small dry skillet over medium-low heat, and cook until they are fragrant and deeply toasted, 7 to 10 minutes, stirring occasionally. Transfer the almonds to a small bowl or plate, and place in the freezer until cool, about 5 minutes. 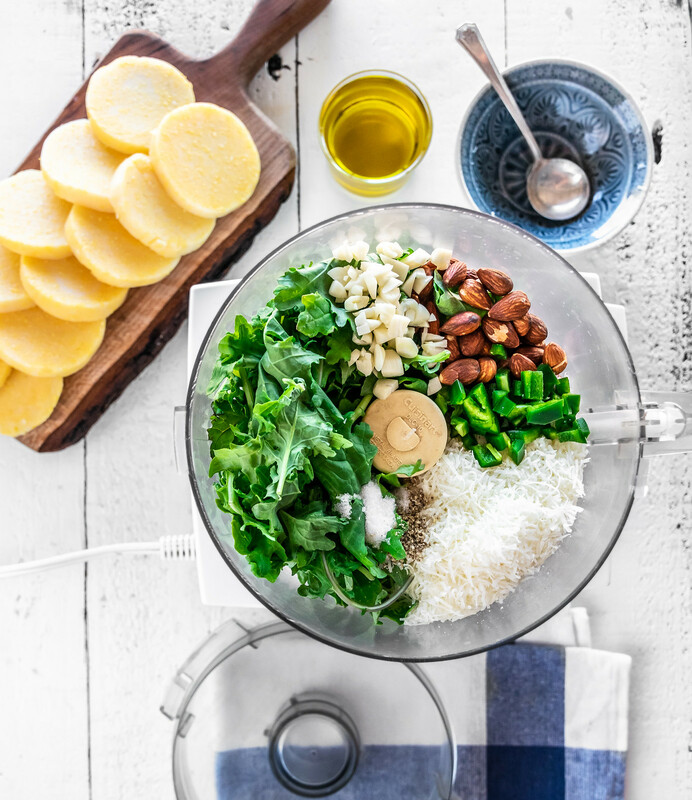 Place the cooled almonds in a food processor, then add the kale, chopped jalapeño, garlic, grated cheese, lemon juice, salt, and pepper. Process in short bursts until the mixture is smooth and no large pieces of nuts remain, stopping to scrape down the sides as needed. Then, with the machine running, add the olive oil in a slow stream and blend until smooth. Transfer to a small container and use immediately, or keep refrigerated for up to one week. If refrigerating, allow the pesto to warm to room temperature before use, or heat it slightly in the microwave—do not cook the pesto or the flavor will diminish. Preheat oven to 350°F/177°C, and line a baking sheet with parchment paper or aluminum foil—if using foil, brush it lightly with olive oil. 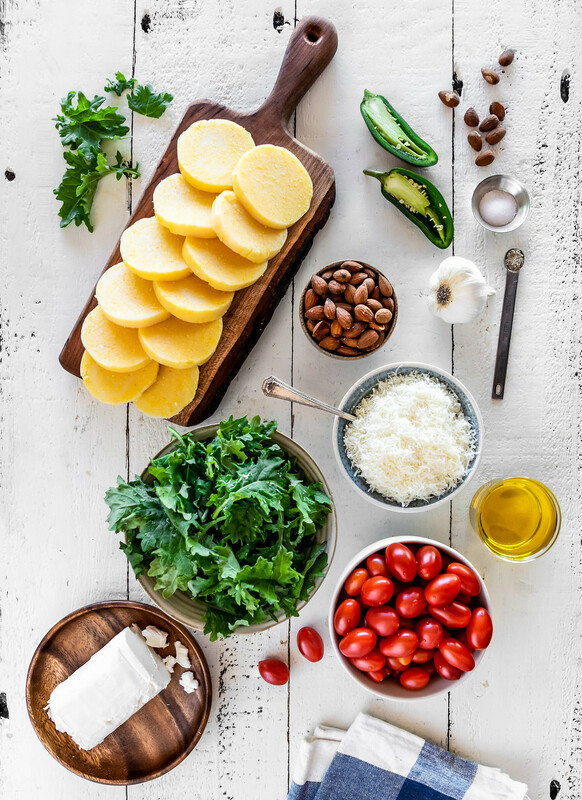 Slice the polenta into 16 circular slices about 1/4-inch thick. Arrange the slices on the prepared baking sheet. Bake for 20 minutes, until slightly crispy around the edges. While the polenta is baking, place a skillet over medium heat and add the olive oil. When hot, add the cherry tomatoes and 1/4 teaspoon salt, and cook, stirring occasionally, until the tomatoes have burst and softened, 5 to 7 minutes. 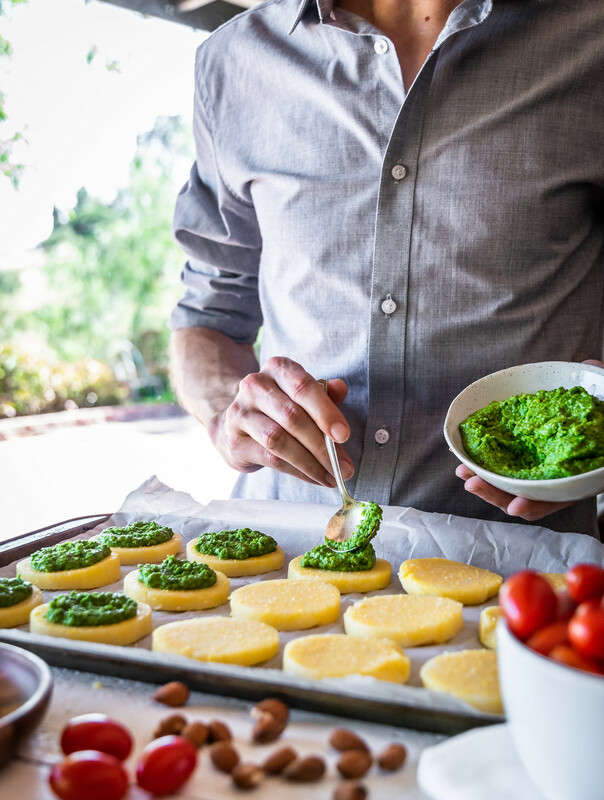 Once the polenta is done baking, spread each slice with a generous spoonful of pesto, then top with 3 cherry tomatoes. Sprinkle crumbled goat cheese over the tomatoes, and garnish with flaky sea salt, black pepper, and red pepper flakes as desired. Serve warm, and enjoy! — Jalapeño peppers can vary widely in heat level. Start with half a pepper, and taste the pesto before adding the second half if needed. Thank you so much Francesco! We’re so glad you enjoyed the recipe!